Pit lakes formed by open-cut mining may have poor water quality as a result of Acidic and Metalliferous Drainage (AMD). Water quality remediation treatments that enhance naturally occurring alkalinity-generating processes (bioremediation) can be used to remediate these water quality problems. Microbially-mediated sulfate reduction using carbon as an electron donor is one approach that shows promise. Carbon amendment can be bulk organic materials, which are often cheap or free. This study investigated a process for determining what organic materials were best for in situ pit lake AMD bioremediation in a remote mining region. 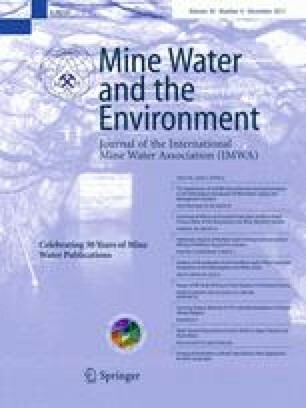 Following a literature review identifying how different organic materials facilitated sulfate reduction in AMD waters, we evaluated availability and costs of acquiring and transporting these materials to a typical remote mine pit lake. We found that those sourcing organic materials should focus on a mixture of sewage sludge and green waste, which are commonly available from mining camps/service towns and from land clearing operations. Thanks to Dr. Ros Green, Michael Guy, and Scott Buchanan (Rio Tinto Iron Ore) for Pilbara mining information. Thanks also to Bob Kinnell (Rio Tinto) for background information on pit dewatering strategies. Many thanks to the many organisations surveyed who assisted us in providing information on organic material availabilities and costs. This work was funded by a research grant from Rio Tinto Iron Ore.